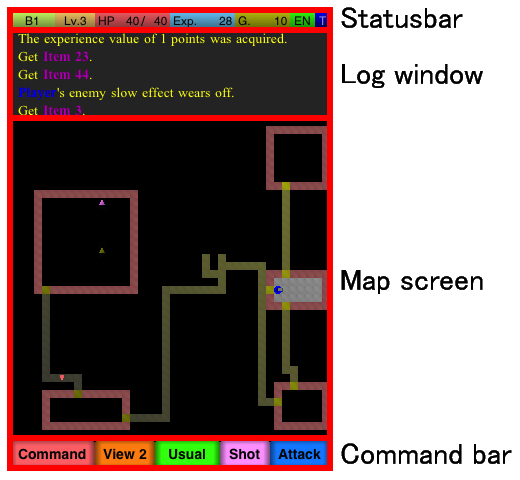 It is a game of the random generation dungeon exploration(roguelike) for iPhone/iPod touch. The enemy doesn't act as long as the player doesn't act, except when the player is a sleep state either. When player's hit point becomes 0, player is returned to the base camp. Player's hit point recovers automatically in the action. When the recovery item is used, it recovers at once. The amount of the recovery is different depending on the kind of the item. When player acts, player consumes energy. When player's charged energy becomes 0, player is returned to the base camp. When player's hit point or charged energy becomes 0, the item is lost at a certain probability. The probability is different depending on the kind of Abyss. The equipment item is not lost. Additionally, one decrease of player's level. When the player safely returns to the base camp, the reward by the acquired gold doubles. Additionally, the reward of the addition of the use arms etc. is given by the content of quest. Statusbar: It is displayed on top of the game screen. Log window: It is displayed under the statusbar. Map screen: It is displayed under the log window. Command bar: It is displayed under the map screen. Tap the map screen while the button at the center of the command bar is Usual. Turn end when tap center of the map screen. Tap the map screen while the button at the center of the command bar is Special. When the Attack button is tapped, player attacked the enemy in the front. The enemy there is attacked when starting moving in the direction where the enemy exists in the next. When the Shot button is tapped, the beam is shot. It is not possible to shoot it when becoming overheating. Various settings can be done. In the state of Spacial, the method of attack changes as the beam of shooting penetrates through the enemy. Select other actions. The command that can be selected is changed by the place where the player exists. Items: The possession item is displayed. It is possible to move to the item box. Mailbox and item boxes: The mailbox and the item box are displayed. Shop: The sales item of the shop is displayed. Go to the floor below: It enters Abyss. Player's information is displayed in the statusbar. The amount of the charged energy remainder: The color changes by the residual quantity of energy. The temperature: It increases because of a special attack and shooting. It becomes impossible to shoot when becoming red. It becomes impossible to special attack when becoming orange. The item transmitted in Abyss can be received. It is displayed only first to ten items. It takes out and it is added to my property. In this case, Mailbox and item boxes is chosen from the Command. It is possible to keep items by putting my property in the item box. In this case, Items is first chosen from the Command. The kept item takes out to a similar mailbox and is added to my property. In this case, Mailbox and item boxes is chosen from the Command, and the item box is selected with an upper right buttons. Abyss is researched. The item taken from Abyss can be submitted as material. Items is first chosen from the Command, and select item to submitting. The lab also has the shop, and the recovery item etc. can be bought. Shop is chosen from the Command, and select item to be bought. This software running on iPhone OS 3.0 or later. It corresponded to Retina Display. The view type came to be changed directly with the main screen. It changes into the expansion (view 1) and the reduction (view 2) with the button under the screen. Other setting changes moved to the menu of the command button. Trouble into which the status of the equip item changed when getting off the floor in the score attack type dungeon was corrected. Add sort button on item list.